We've all been there. We sit at our desk cramming for that upcoming exam or practice those few measures again and again before our piano recital. 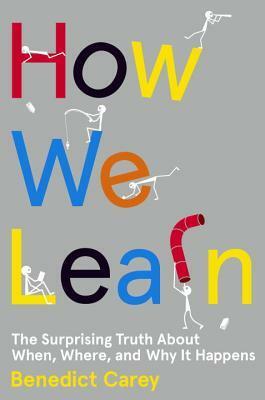 From childhood, we are taught that certain habits will make us better at learning. Having a designated study spot will help us focus, a silent study area works best, and maintaining the same routine every day will help us to keep all of those facts in our brain. But what if that is all wrong? What if our brains are better and more nuanced than we ever gave them credit for? In How We Learn, science writer Benedict Carey analyzes brain chemistry and psychological studies to impart the best ways for us to pass our classes, play a perfect recital, and deliver a flawless presentation. The book begins with a basic primer on your brain. Don't worry, the jargon is all easily understood even if you have completely forgotten every bit of high school anatomy and physiology. Carey then delves into retention and problem solving to show us the downfall of commonly used study habits. Finally, we look at our subconscious mind and the learning we do without even knowing. Our brains work mostly through association, so the downside of studying in the exact same setting every time is that you only give your brain one connection. Instead, if you study in a multitude of places with differing approaches, you might remember the date of the Battle at Gettysburg because that's the moment when that guy spilled his coffee at Starbucks and because that was the moment your favorite song came on Spotify. (Sorry parents, music is not actually a study deterrent!) We need to use different techniques and sometimes distractions are good because they give our mind a moment to work out problems. Carey even writes about forgetting. As it turns out, forgetting is a filter - it is the brain's way of determining what we need and what is superfluous. We also remember something we have forgotten and then relearned better than something we learned just once. Sleep is also integral, although it needs to be utilized differently for different tasks. For some things, it's better to study hard and then sleep in while other tasks require us to get a good night's sleep and wake up early for a final burst of study. I gained a lot from this book, both for myself and as a parent. This would be a great read for a high school or college student or anyone who is interested in the basics of how we learn. While this is probably oversimplified for many educators and scientists, it is a great starting point for students, their parents, and anyone who wants to learn faster, smarter, and better. I may have to pick this up. My daughter just does not retain information. I try to get her to walk around and read it out loud. Walking around seems to help, but she thinks it's silly. Thanks for a great review! I'm interested in getting this book to give as gifts to my son in grad school and to my grandkids. Sounds great, and I appreciate being introduced to it. It was great! I had so many moments when I thought, "Oh, that makes so much sense!" I bet your son and grandkids will learn some new techniques. This book has definitely caught my eye, though I despair of finding time to read it. Thanks for taking the time to review it! Isn't that the plight of every reader?!? "I despair of finding time to read it..." So many books! This sounds really interesting! As a grad student, I feel like I'm always struggling to remember more facts with every new paper that comes out in my field, so I'd love to read about ways to learn better.